Is Chinese swimmer Sun Yang the biggest jerk of the Rio Olympics? China’s Sun Yang reacts after competing in a men’s 200-meter freestyle semifinal at the 2016 Olympic Games on Aug. 7, 2016. Known for: Swimming far and fast, making excuses, annoying his rivals. 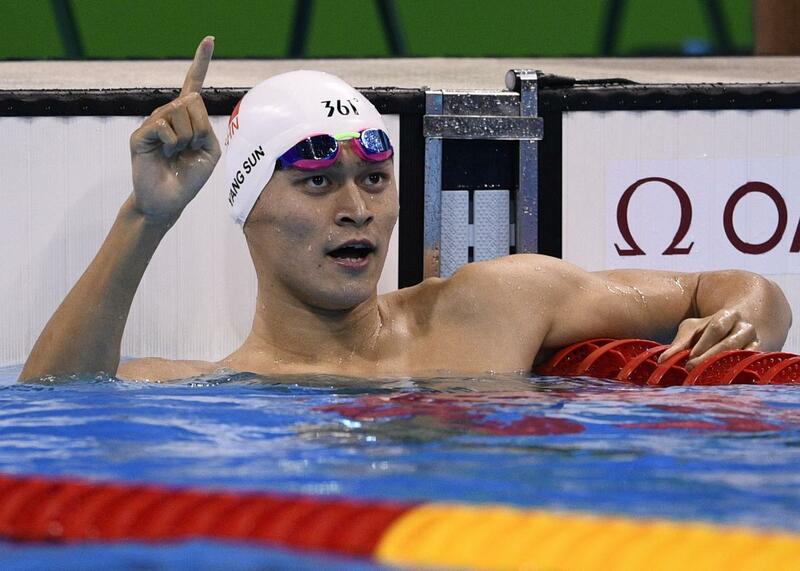 Why he might be a jerk: Sun is one of China’s best and most controversial swimmers. He won two gold medals in London in 2012, in the 400-meter freestyle and the 1,500-meter freestyle, setting an Olympic record in the former and a world record in the latter. Since then, he has done several jerk-seeming things. In 2013, according to the Australian, the swimmer feuded with his coach, Zhu Zhigen, over his allegedly lax training habits, with the older man accusing Sun of spending too much time “indulg[ing] in commercial activities” and consorting with a flight-attendant girlfriend. When Sun tried to fire Zhu, the older man suffered “a relapse of high blood pressure and a thyroid nodule.” This sounds like the swimming equivalent of what Latrell Sprewell did to P.J. Carlesimo. In 2014, he spent a week in jail after he rammed his car into a bus while driving without a license. In explanation, Sun offered one of the worst excuses I have ever heard: “Because I have been focusing on training and competition, I had only a hazy knowledge of the law, which led to my mistake.” I’ve never met the guy, but you’d have to imagine Sun knew this was a bad excuse and yet used it anyway, which implies he didn’t really care whether or not anyone believed him, which is a pretty jerky attitude to take, given that, you know, he collided with a bus. That same year, Sun tested positive for a banned substance—the stimulant trimetazidine—and received a three-month suspension from the China Anti-Doping Agency. His excuse this time, that the medication he took for chest pains contained trimetazidine, was better than his bus accident excuse, I guess. In 2015, citing chest pains, Sun withdrew from the 1,500-meter freestyle final at the world championships, a race he had won at the 2013 world championships and 2014 Asian Games. * Perhaps coincidentally, the withdrawal came hours after Sun allegedly tussled with Brazilian swimmer Larissa Oliveira during a practice session. Speaking to the Sydney Morning Herald—the Australian media has been all over the Sun Yang beat in recent years—a Brazilian coach said Sun “tried to elbow [Oliveira] and kick her” because “she was bothering him,” and insinuated that Sun had also menaced members of the Canadian, South African, Chilean, Danish, and Argentinian teams. See, that’s jerky behavior, because we all know the civilized way to confront people who are bothering you is to put them on a bus and then drive your car into that bus. Sun’s tenure at the Rio Olympics has been predictably controversial. Last week, he splashed rival Australian swimmer Mack Horton during a practice session, a maneuver Horton interpreted as hostile and disruptive. “He splashed me to say hi and I ignored him because I don’t have time for drug cheats,” Horton said later, in a statement that was itself sort of jerky. The Aussie later bested Sun in the men’s 400-meter freestyle, taking gold to the Chinese swimmer’s silver. The two will meet again in the 1,500 meters this coming Saturday, and Sun apparently expects a victory. “1,500 meter. I am the king. Yeah?” he informed the media. King of the jerks, maybe! Why he might not be a jerk: To be fair, this Mack Horton guy seems like kind of a jerk himself. Also, splashing can be a convivial gesture, as demonstrated in Bobby Darin’s classic Olympic swimming anthem “Splish Splash.” And I haven’t seen it conclusively demonstrated that Sun doesn’t have heart problems. Finally, Sun’s blowup with his coach apparently came after said coach tried to get him to dump his girlfriend so he could spend more time in the pool. You tell me who was the real jerk in that situation. Jerk score: I’ll give Sun 2 out of 3 for style, because he was driving a Porsche when he collided with that bus, and a Porsche is a pretty slick car. 3 out of 3 for technical merit, because he flawlessly executed the classic jerk move of boasting about how great he was immediately after losing a race. 2 out of 3 for consistency, because he crashed that Porsche into a bus in Asia and has annoyed swimmers from North America, South America, Africa, Europe, and Australia. But what about Antarctica, Sun Yang? What about Antarctica, I say! And 1 out of 1 in the category of “Did he give his coach a thyroid nodule?” 8 out of 10 for Sun Yang. *Correction, Aug. 8, 2016: This post originally stated that Sun Yang won the 1500-meter freestyle at the 2013 and 2014 world championships. He won that event at the 2013 world championships and 2014 Asian Games.